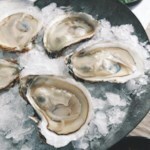 Shuck oysters, discarding the flat top shells. 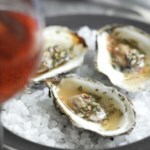 Pour the oyster meat and the liquid left in each bottom shell (the oyster "liquor") into a bowl. Then pour through a fine-mesh sieve, transfer the liquid and the oyster meat to separate containers and refrigerate until ready to cook. Rinse the deep bottom shells to remove any grit and set aside. Bring a large pot of water to a boil. Add spinach, watercress (or additional spinach) and celery leaves (or parsley) and cook just until wilted, about 30 seconds. Drain and rinse thoroughly with cold water to stop the cooking and set the bright green color. Squeeze out excess water. Chop the greens very finely. Melt butter in a large skillet over medium heat. Add the chopped greens and scallions and cook, stirring, until the scallions are soft and any liquid has evaporated, about 2 minutes. 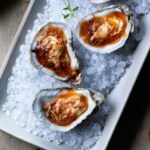 Add the strained oyster liquor, Pernod (or other licorice liqueur), lemon juice and hot sauce and cook, stirring, until the liquid is mostly absorbed, about 5 minutes. Remove from the heat. Meanwhile, preheat oven to 450°F. 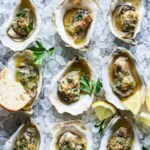 Line a shallow baking pan or a baking sheet with about ½ inch of rock salt (or coarse salt) or loosely crumpled foil to make a base for the oyster shells. Nestle each reserved shell in the prepared base so it will stay level. 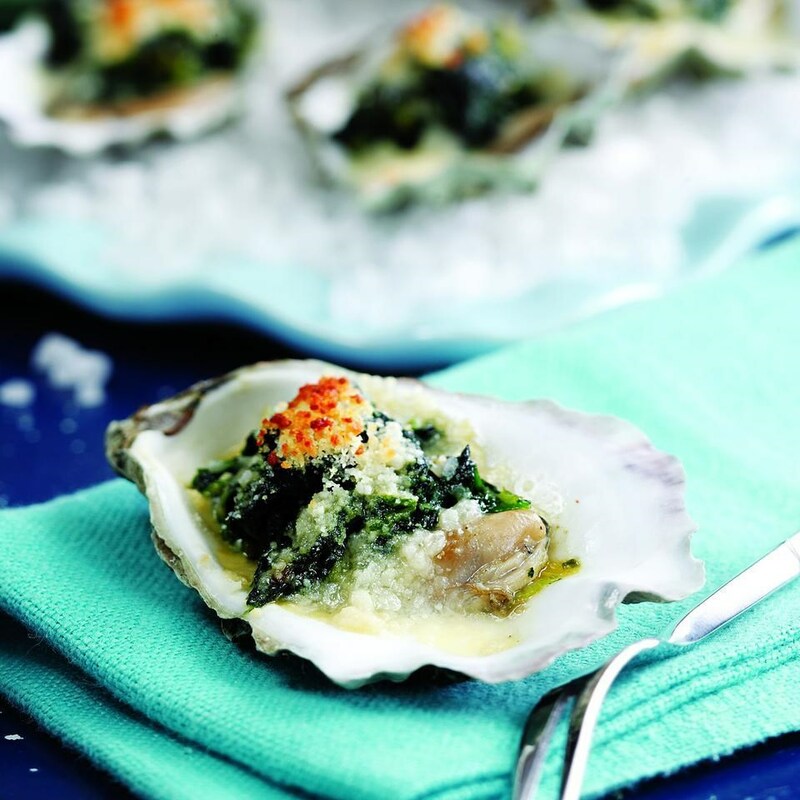 Place one oyster in each shell, evenly divide the green sauce among the oysters and sprinkle with Parmesan. Bake until the sauce is bubbly and the cheese is lightly browned, 8 to 12 minutes. 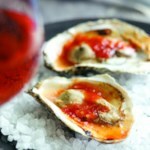 Make Ahead Tip: Prepare through Step 1; refrigerate oyster meat and liquid separately for up to 1 day. Prepare the sauce (Steps 2-3), cover and refrigerate for up to 1 day.